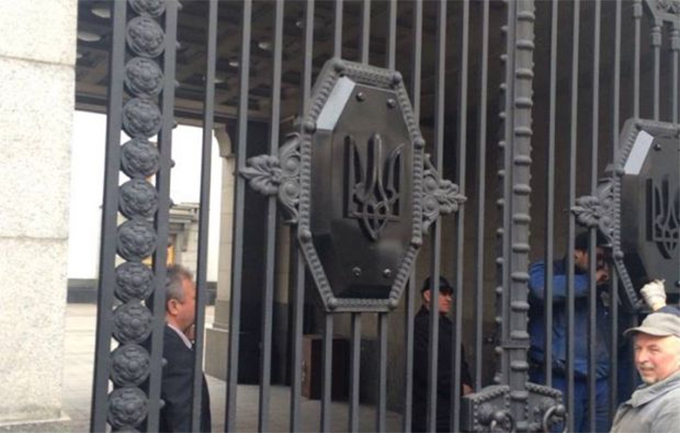 from redicecreations.com: Last Friday – Good Friday to those that follow the Gregorian Calendar – saw the Soviet symbolism adorning the gates the Ukrainian parliament removed, being replaced by the national Tryzub emblem. About time, considering the Soviet Union collapsed more than two decades ago. This symbolic act being a sign of things (that seem very likely) to come – and come in very short order. It is anticipated that prior to the 9th May Victory Day holiday in Ukraine, a draft Bill proposing the banning of both Nazi and Communist symbolism, ideology and propaganda will garner more than sufficient votes within the Rada. Deputy Prime Minister Vyacheslav Kirilenko, who submitted the draft Bill, stated one of the main aims of the document is the recognition of the Communist totalitarian regime in Ukraine 1917-1991’s, its crimes and its pursuance of a policy of state terror. It would therefore bring about, legislatively, the equivalence with that of the Nazis already inscribed into Ukrainian statute. “All symbols, all the propaganda of Nazism, National Socialism, these values, any Nazi activity, fascist groups in Ukraine are prohibited.” – Thus, a common recognition of both Communist and National Socialist totalitarian regimes, together with the prohibition of their symbolism and propaganda, seems likely to be realised in Ukraine within the next month. Ukraine seemingly following the Polish route regarding Communism, and the Franco/German legislature with regard to Nazism – at least in spirit if not in the actual copy/cut/paste legislative text. It appears that Ukraine, as with most other “enlightened” ex-Soviet States, follows the script of toppling a large number of Lenin statues first, then legislates against the historically cancerous USSR second. So be it. There are, however, going to be issues with the new law (should it be passed and subsequently signed into law by the President) – as the Ukrainian legislature is entirely incapable of drafting and passing clear, unambiguous, cleverly worded, law. Will contravention of the new law be an administrative/civil matter – or a criminal matter – or both? At what point would a civil/administrative matter become a criminal matter should the new law provide for both courses to be pursued? Is it dependent upon prosecutor’s discretion and severity of the breach – or something/somebody else taking particular umbridge? Are there any exemptions? What of the remaining Great Patriotic War veterans who march beneath their Communist/Soviet military unit flags, bearing a chest full of Communist/Soviet medals every 9th May? Yes those remaining will all soon die off, as nature catches up with us all eventually, but what of the more recent Afghan veterans whom also march bearing a chest full of Communist/Soviet medals from USSR campaigns? War memorials? Does the new law mean the removal of all Lenin statues – or is Lenin deemed – somehow – exempt from being a Communist symbol or source of propaganda? Does it mean the new law generates the prohibition of the currently still legal Communist Party – or does it mean the Communist Party can still exist, but cannot employ the symbolism and propaganda of the past? Instead of a red flag and hammer and cycle, perhaps something…..different? Some form of fluffy kitten meme on a pleasant pastel backdrop? By banning the political extremes of left and right, it does not magically remove the ideology nor the followers, but simply drives it underground – for it cannot legally remain in the open. In the politically difficult moment Ukraine finds itself within, does creating the conditions for a red/brown extremist underground alliance seem timely? Is there ever a good time? Is there a time frame within which all public buildings – and possibly private buildings too – must remove the Soviet Star? If so, at whose cost? The owners? The City? The Oblast? The State? The Soviet red star is a Communist symbol after all. How intrusive is this law? Is the author to rid himself of the written works of Marx, Lenin and Trotsky? The copy of Hitler’s Mein Kampf? No quotes from them within any blog entry text? The small Lenin bust has to head for the rubbish bin? All precautionary acts in preparation for when the SBU next call in for coffee and notice some banned symbolism or books that could be classed as propaganda?